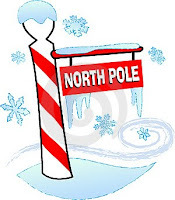 Richard's Page: Did I Find the North Pole? After all of my trips to Barrow, I think that I finally found the elusive North Pole. It is a little thinner than I remember seeing in books and on TV while growing up. Also I expected some sort of flashing beacon. And here all this time, people have been telling me that the north pole is located about 20 miles east of Fairbanks near the Santa Claus House. Actually, the tower is some sort of antenna in the process of being set up by a couple of researchers from Fairbanks and the striping is a reflective material so it can be seen in the wintertime by snow machine drivers. But it still looks kind of looks like the stereotypical north pole I've seen in cartoons while growing up.